Takeaway: Galvanization can be a cost-effective method that protects steel from corrosion and adds to a building’s visual appeal. Australasian Corrosion Association is affiliated with The Australasian Corrosion Association (ACA) and can be contacted using the options on the right. For info on how we work with industry partners click here. As part of the Arts West Redevelopment project, the University of Melbourne has renovated the Arts faculty building on Medical Road in the main Parkville campus. 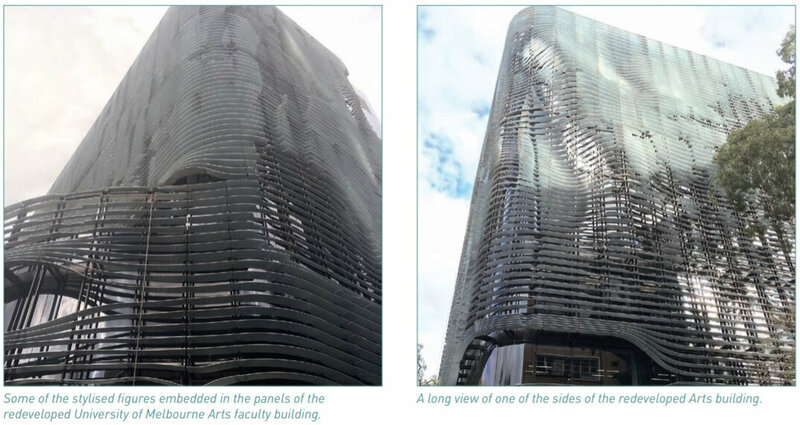 A stunning visual feature of the new building is the louvered façade on three sides; the steel sections of each louvre have been shaped so that they form part of a series of 3D images that can be viewed from different angles as people walk around the building. To protect the steel from corrosion and add visual appeal, the project team opted to galvanize the louvres. 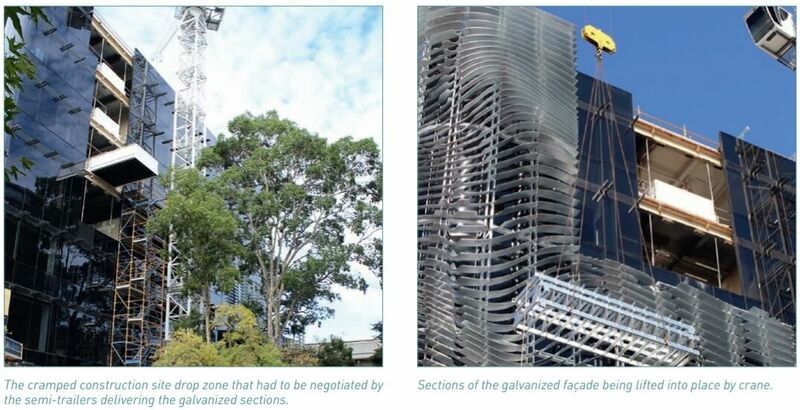 Industrial Galvanizers (IG), a member of the Galvanizers Association of Australia (GAA), was engaged to take the more than 480 individual steel sections and coat them in zinc prior to delivery to the construction site. Galvanization provides a long lasting, tough, durable coating that provides complete corrosion protection both inside and out in addition to enhancing the appearance. A GAA datasheet explains that a galvanized coating completely encapsulates all surfaces of a steel structure and acts as a barrier to the surrounding environment. The coating has a natural electrical potential which cathodically protects the steel from coating imperfections caused by accidental abrasion, cutting, drilling or bending. The last critical component is the zinc patina itself, which is relatively insoluble and passive, thus greatly reducing the corrosion rate. The stability of a galvanized surface means that the time between maintenance inspections is much longer which greatly reduces the life-cycle costs of the structure. In today's environmentally conscious world, galvanization is a very sustainable process. “Both the metal substrate and the zinc coating can be repeatedly recycled forever,” Golding added. Galvanizing is carried out to Australian and New Zealand Standard AS/NZS 4680 ensuring minimum coating thicknesses are applied and making coating life and performance reliable and predictable. Different environments are classified on a scale of C1 to C5, with C1 being a very benign location to C5 being extremely severe in terms of temperature extremes, humidity and corrosive components such as salt or chemicals. Average suburban areas—such as where the University of Melbourne is located—are mostly classified as C2. The standard AS/NZS 4680 calls for minimum zinc deposition thickness of 85 microns for the items galvanized in this project. The estimated life-span and performance of a galvanized structure is calculated using the thickness of the zinc coating and the severity of the operating environment. Combining the results—Parkville being C2 and the zinc thickness meeting the requirements of the standard—gives the new façade an expected lifespan of more than 99 years. A galvanized structure lasts longer and requires less frequent inspections, so in the vast majority of cases is the cheapest process in the longer term. Every part of a galvanized article is protected, even recesses, sharp corners and inaccessible areas. No inorganic coating applied to a structure or fabrication after completion can provide the same protection. Maintenance requirements add to the life-cycle costs of any facility or structure, especially when plant shutdown or disruption to production is involved. Asset owners need to consider initial cost, life cycle costs, aesthetics and the environment when choosing a coating system. It is important to also remember that galvanization is not appropriate for every situation. Note: The Galvanizers Association of Australia represents many of the leading galvanizing companies throughout Australia, New Zealand and Asia. Established in 1963, the Association works with companies to ensure the highest standards in design and quality of galvanized products. GAA's objectives are to provide technical consulting services on a not for profit basis and to assist consumers achieve the economic benefits inherent in the correct design and application of the galvanization process.